Ellijay (GA) – A raccoon that was recently found in a residential area of Ellijay in Gilmer County, Georgia has now tested positive for rabies. The raccoon was out during the daytime on May 9 and appeared to be sickly as it wandered in the campground area of Coosawattee River Resort, a gated community in Ellijay. A resident, concerned about the danger the raccoon might have posed to people and pets in the neighborhood, shot the animal so it could be tested for rabies. The raccoon was tested by the Georgia Department of Public Health Laboratory on May 10 and the positive results were reported on May 11. 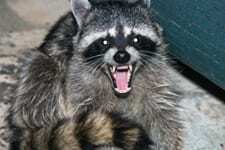 There was no known human or domestic animal exposure to the raccoon. Health officials are continuing to remind the public to avoid all wild animals and pet owners should maintain rabies vaccinations in their pets. If a pet receives an initial one-year vaccine, it can receive a three-year rabies vaccination on the following year. Rabies is prevalent in wild animals such as raccoons and skunks but can be found in coyotes, foxes, bats, bobcats and other wild carnivores. Rodents and opossums are rarely found with rabies, but a bite from any wild mammal should cause concern and be reported to a healthcare provider and the local environmental health office. Children should be warned to avoid contact with wild mammals and any stray dog or cat and to report any contact with these animals to an adult right away. For more information about rabies and its prevention, log onto the Centers for Disease Control and Prevention (CDC) website at CDC Gov Rabies . A large water main break on the main feed line to the Coosawattee River Resort area is causing water pressure in parts of the water system to drop to dangerously low levels. When this occurs, a potential health hazard may exist in these areas of zero pressure from backflow and/r back siphonage of water of unknown quality into the water distribution system. 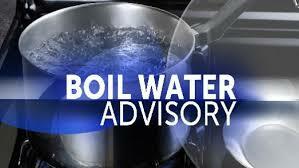 In order to protect the public from a potential health hazard, all citizens that have experienced water outages and/or low water pressures are advised to “boil” all water prior to use for drinking, cooking or preparing baby food. The water should be boiled for at least one minute after reaching a rolling boil. Citizens should continue to boil their water until they are notified by their drinking water utility that the water system has been restored to full operation, and that the microbiological quality of the water in the distribution system is safe for human consumption. The areas affected include but are not liited to: All of the Coosawattee River Resort, Highway 5 South (from Legion Road south), Legion Road, and the Highway 382 area. 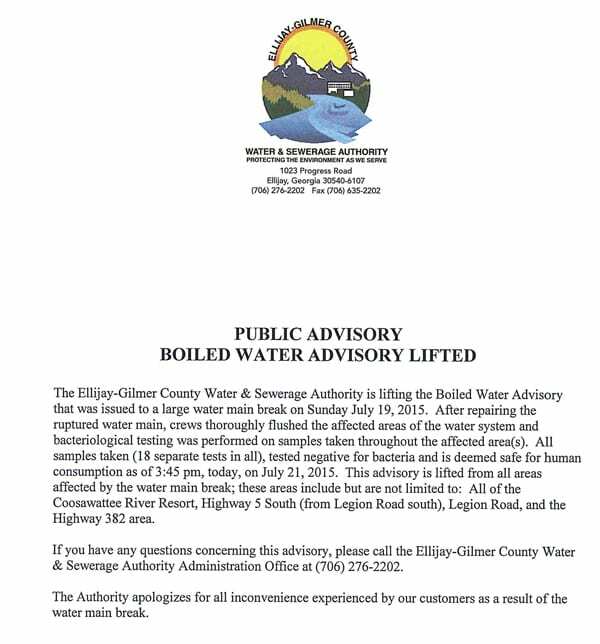 If you have any questions concerning this advisory, please call the Ellijay-Gilmer County Water & Sewerage Authority Administration Office at (706) 276-2202 or after hours at (706)635-7929. The Authority apologizes for this inconvenience and all customers should be assured that the Authority will work non-stop until this issue is resolved. Fetchyournews.com has had the privilege of following the progression of the New York Says Thank You 2011 “Barn Raising” project in Ellijay, GA. Recently FYN reports, Brian K. Pritchard had an opportunity to talk with Jim Fox, “volunteer extraordinaire” about Jim’s experience with this wonderful project. Jim explains the impact his involvement has had on him and the community.